This entry was posted in Uncategorized and tagged Arteta, Premier League, Ramsey, RVP, Song, transfers, Wilshere. Bookmark the permalink. Great article, The final games where Arsenal conceded mainly from open play showed the effect Arteta had on the team. The desire to attack from Rosicky, Ramsey and Song went against us many times when the defense were left open especially if Vermaelen and the fullbacks went on the offensive. As a sub-unit, the defense have definitely improved but as a team, it looked as if Wenger does not even understand the concept of defense. I do not think that was Wenger’s intention but the players let him down there when other that Kos, no other player was thinking of the shape of the team during a transition. This is where Jack’s play helps as when he plays, Arsenal’s shape looks more balanced. Spot on. I agree. Check this link guys pcstorage.org. you’ll like what it as to say. Impressive article! Agreed on most points. You may not like this but amongst the players we have returning from loan spells lies the solution. And that is if Arsene decides against midfield reinforcement….Denilson! Yes, at times he played as though a forward pass was to the equivalent of one asking for a death sentence but he kept the team ticking. He slotted the ball into open spaces and out of danger. It was entirely upto Mr Wenger to play him with players that would compliment his style. Instead he had Diaby played out of position on the left and B52 on the right. How was that supposed to work??? Anyway,has anyone of you ever wondered why he was so excited about returning? Mr Wenger loves and wants this guy back… Watch out A. Song…. No he didnt keep the team ticking. This is ridiculous to suggest this. 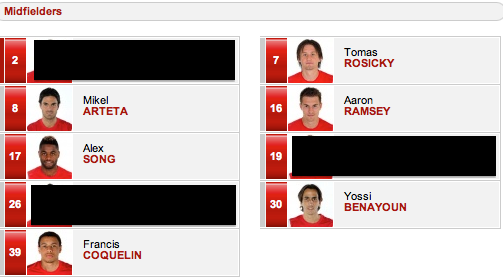 Arteta is the player that Denilson should of / was expected to have been. Keep it simple stupid would be apt for that failure of a footballer. Denilson should be no where near this team. I think you have a full house on agreement here. I am glad you made the point about Song being encouraged to make the crucial passes, because there was no one else either willing or able to? So, is your point we need someone in the DM role as well as Song(my view), or somebody more creative and keep Song on defensive duties.? The weakness with the latter is, we may lose Song and Frimpong to the AFCON this time around …. that could be 6 weeks plus and no effective defensive midfielder other than Arteta? I know Gibbs got a lot of stick for being ‘out of position’ but he never got the cover that Sagna did on the right from both Walcott and Arteta. You rightly point out, it is not always necessary to tackle, but simply delay the opposition progress while the back four regroup. Apart from Coquelin, there are another couple of youngsters who could break into the team, Eisfeld and Ozyakup, even without Diaby and Wilshere regaining their top form straight away. Now whether ‘Stupid’ will listen, or pay the market price for the right person is another matter?? that was brilliant analysis.. sums up how I felt about this team perfectly.. Brilliant article. Great to see some stats on our midfield, it is easy to see but to have some figures to back this up just shows how lacking in the MF we are. 2 world class MF’s & we are there & i am sure this will convince RVP to stay. But will wenger actually buy what is required? I really much doubt it, it is already feeling like last summer already. ‘Wenger distances himself from……..’, ‘Wenger says ‘not much will go on in terms of quantity’!!! Is he blind?? How good would our team be if the fans got to choose 2/3 players to buy……………simpler world for all of us!! Excellent analysis, but let’s not forget that Arteta is not really a DM & sometimes lacks positional sense and/or concentration (witness the goals conceded recently against QPR, in one instance standing & watching as Diakite ran past him to score)…and in answer to one comment, Denilson is definitely NOT the answer, he is a terrible defender who persistently over-commits in midfield & offers no protection for the critical space in front of the CBs (one of the reasons TV has been caught out of position so often is that he tries to compensate for the lack of midfield cover)…what is required is a DM like Gilberto who actually likes defending!…Koscielny has the ideal skills set & would do an excellent job in front of Mertesacker & Vermaelen. We should have bought Ozil 2/3 years ago when he had 1 year left on his contract at Dortmund. Goetze seems like a natural solution and quite a ‘Wenger’ buy; young, technically proficient and at a reasonable rate. We’ve got a couple of German’s now, so he’d find it easier to settle in. Wow, funny how conveniently you’ve ignored Rosicky, post Jan without a doubt Rosicky was our best at mid-field, second only to Arteta. Good write up…I was going to write something very similar for my own blog having hinted at the importance of Arteta, but you’ve beaten me to it! Do you mind if I post a link to this? Spot on with your analysis – you need to blog more. It is one of the more sensible blogs out there. Too many times, the opposition were allowed to run at the defenders and nothing was done to drill it into the players not to go forward like a kamikaze (Vermaelen should be told this as well). With the way that we play, the fullbacks provide width and the crosses, so we need two men sitting deeper to counteract this. Unfortunately, it didn’t happen once Arteta was injured. I would love to see a DM and an attacking mid – like Kawaga come in this transfer window. God knows that we need them. Diaby isn’t ever going to be fit and it will allow for Jack to recover. Comparing the current midfield to that of the likes of Vieira and Gilberto Silva is a tad unfair on Song. He’s the only “anchor” in midfield and therefore it is his duty to cover twice as much lateral territory as his predecessors. The formation difference between the two teams also is worth noting. Vieira and Gilberto worked so well (as did Petit and Vieira) because they covered for one another perfectly. Great article and glad to see you back. Although Wenger seems slow to fix defensive problems, he has shown the capability to do it. I no longer hold my breath every time the opposition gets a corner. With a solid defensive midfielder and regular drilling, we can hopefully defend like Dortmund. you suggest any other blogs/websites/forums that cover the same subjects?